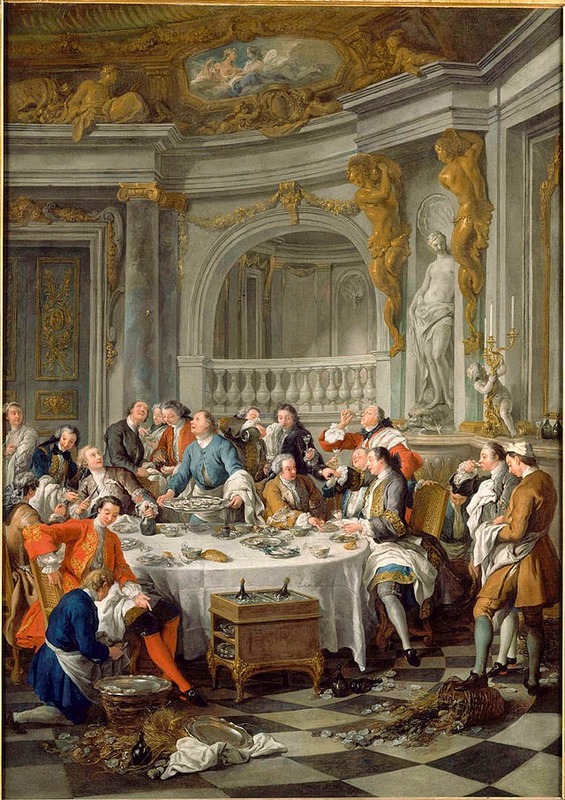 This famous picture of a post-hunt oyster lunch by Jean-François de Troy, dated 1735 and now in musée Condé Chantilly, was originally commissioned for Louis XV’s private dining room. It is probably the first first painting to depict the drinking of champagne; if you look closely, you can see the cork mid-air. The man who opened the bottle is still holding the knife that was used to cut the string that held the cork in place. In these early days of champagne, glasses were drunk in a big gulp and then turned over in a bowl to allow the sediment to drain out. (A technique for ridding the fizzy wine of troublesome sediment was only perfected by Veuve Clicquot in the 19th century).